The rules for riding in a group boil down to etiquette and also getting the maximum out of yourself on every group training you go on. These 19 rules – devised by an Irish cycling club – cover everything. As well as encouraging riders to select a group whose speed suits them best – to avoid being dropped or not training hard enough – Scott-Orwell has gone into the fine detail of how to train in a group. 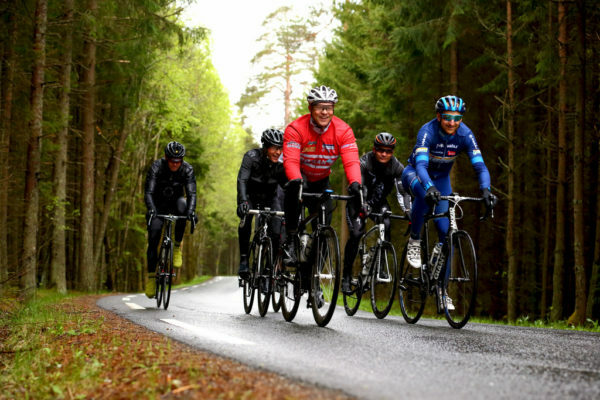 This is about group cycling etiquette as well improving as a bike rider. Moreover, these group cycling etiquette pointers are applicable to anyone training with two or more others. And they cover all the bases. Riders at the front and rear should warn of approaching cars, particularly on narrow roads. Call out for vehicles – shout “car up!” & “car back!” Panicked cries are not necessary. Just shout loud enough for the person in front/behind to pass on the call. Point out and call out any road hazards ahead. These include potholes, drains, speed ramps, animals, parked cars, opening car doors, wet or icy road surface etc. Make sure to keep pedalling downhill when you are at the front of the group so that the riders behind don’t bunch up behind you. It can be a bit fraught if everyone has to reach for their brakes. Change into the big ring going downhill if conditions/speed require it. Bring a minimum of one spare tube, tyre levers and a pump. A second spare tube and a multi tool can be useful too. Also, bring some money in case you need emergency food supplies and a mobile phone in case you get stranded. Bring plenty of water or sports drink. Dress for the weather, and bring a spare jacket if rain is expected. Use your initiative regarding the conditions, if it looks like the weather is too bad to go out but the spin hasn’t been officially cancelled, perhaps it is better to stay indoors!